I’m seeing similar behavior in my environment (growth by several GBs per day). I’ve confirmed this is not caused by Test Attachments (I have about 200 MB in test attachments). The tbl_Contents table is just growing constantly. This just started after I upgraded to TFS 2013 Update 2 (I was on TFS 2012 Update 3 before the upgrade). Have you found anything that helped with this situation? We haven’t found a specific reason. I think it came in with TFS 2013+. I was hoping Update 2 would fix it. As in the post the workspace clean up seemed to give us some reprieve, but it has not resolved the growth issue. OK. Thanks for the update. I opened up a ticket with Microsoft yesterday and they just got back to me and mentioned that this might be caused by a bug with the new CodeIndex functionality. They suggested to disable it for the time being until a fix is available. Below is some of the text from the support engineer. I’m in the middle of running the last commands and it has already freed up quite a few GBs from my system. Hope this helps you too. 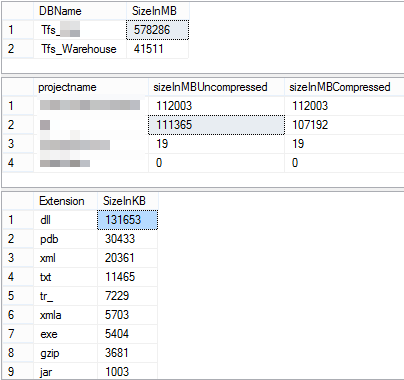 SQL will not free up disk space unless you use DBCC Shrinkfile command against the database. Quick update. It looks like disabling CodeIndex worked in my environment, and running these commands appeared to clear up the majority of our space issues. 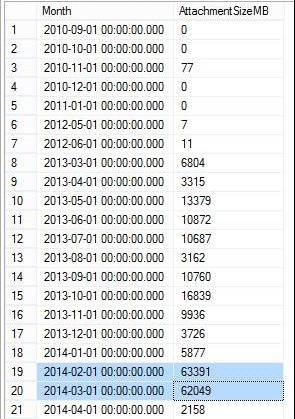 Transaction logs are also more inline with what they were before the upgrade to 2013. The case is still open in order to get a fix for the CodeIndex functionality, but at least this helps keep things running in our environment until that time. Did this work in your environment? Awesome. Thanks for the update. It is Saturday now, I’ll try it Monday morning and let you know. Thanks! I’ve run the commands and updated the post. So far not looking like it is doing much unfortunately. I’ve been working with Microsoft for the last few days the first thing I asked them about was the stored procedures that people are consistently saying should be run. Microsoft says that the stored procedures prc_deleteunusedcontent, and prc_deleteunusedfiles should stop being run period. When they are run TFS will not be accessible it will lock your tables to the point that developers will not even be able to check in or check out their code. This is bad in a very busy TFS environment. I tried the same to solve some problems with TFS2015. But it did not remove anything from tbl_Content even though I destroyed lots of content before vis TFS Destroy. We are having this data growth issue since upgrading to TFS 2015. Did you ever find a solution? Not really. I’m on hosted VSTS now at visualstudio.com. If you can takes out a huge amount of work. The issue ended up being a bug that I had to open a ticket with Microsoft to fix. The fix was never implemented even in TFS 2013. I would suggest giving MS a call and have them work with you to fix the issue. 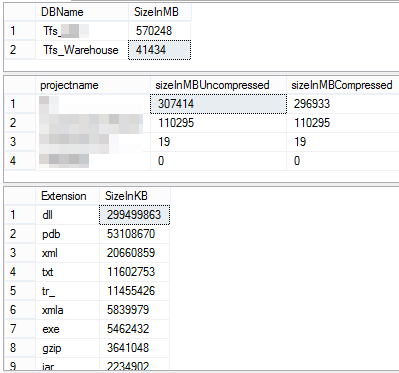 I was able to reduce the SQL files with 600GB from 1.1 TB without any issue. 2) put dev’s to destroy what’s older or no longer used or MOST important !!! what’s fixed and history can be destroyed. How they will accomplish this ? b) Destroy from TFSExplorerExtension suggested by me above ! 3) wait one day then make full backup !! 5) monitor free space on SQL server.